I'm a long time fan of John McFetridge's fiction and I'm a huge fan of his Toronto series. He has been called the Canadian Elmore Leonard but I maintain he's closer to the Canadian George V Higgins. These earlier works were perhaps a little denser, and Black Rock seems, in part, to be a move, towards finding a wider audience with a more streamlined, traditional, crime fiction series/series character. 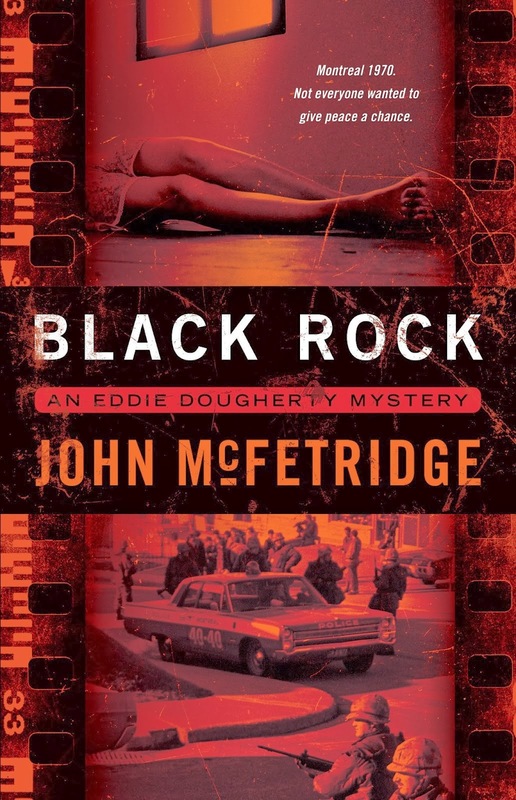 Black Rock is set in Montreal in 1970, a time of chaos where bank robberies, kidnappings, and regular bombings are on ongoing occurrence. In this atmosphere regular crimes are still happening but the cities resources are caught up in special task forces, high profile crimes, and bomb chasing, and so a girl getting murdered doesn't get the attention deserves (or any at all really). Enter Eddie Dougherty. Because he knows the neighborhood, and the family of the murdered girl, one of the homicide detectives takes Dougherty under his wing and encourages him to investigate when he can and teaches him a little bit on how to be a detective. Essentially, Black Rock is about trying to do regular policing in a heightened climate of fear. The secondary characters were one of the highlights for me. From the detectives as mentors; to the bomb squad guys who show up in coveralls wielding nail clippers who ultimately decide to just kick a bag of dynamite into the river to deal with it. The main protagonist is a little bland at times in comparison. On one hand he's a young guy just starting out in his policing career so it'll be fun to see him rise through the ranks in future installments. On the other hand he is the series character. Bottom line: Solid start to a series with a tense and exciting backdrop filtered through all of those things that John McFetridge does so well. There is great dialog, great moments of observation, and small moments to make you laugh. You'll want to give this one a look when it comes out. I scored an ARC a while ago and loved the book. It's a bit of a departure, but all the things that make JOhn's writing so enjoyable are still there, turned a few degrees to view a different situation from a slightly different angle. HIghly recommended. Black Rock concentrates a bit more on a single, central character than do the Toronto books and the excellent Tumblin’ Dice. Another difference between it and the Toronto series is its setting of Montreal, McFetridge’s home town. So, while the novel is explicitly centered on historical events in ways his others are not, it’s also the author’s most personal book, I think.